The CCLD Bookmobile has had a busy summer visiting Summer Cohesion sites, Big Flats Parks and Southside Parks. 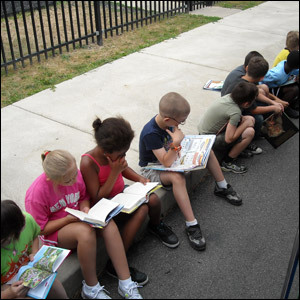 Summer Cohesion has about 700 children registered and the Bookmobile visits all of them each week. Picture #1 shows what our shelves look like after the last class visits on Friday AM! 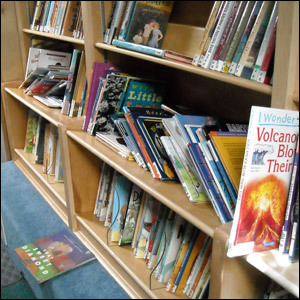 There is a quiet reading time daily at the sites, so each child chooses a book to read for the week. When time allows we give out tattoos or play guessing games. But most of our time is spent recommending books or helping them find what they are looking for. This program makes it possible to take pictures like #2 and #3. The Bookmobile also made an appearance at Horseheads Family Days on Saturday July 16th. It will be at Strong Kids Safe Kids on August 20th. See you then! Click here to view our summer schedule.